In the early 1960's Cleve Backster, a historical figure in the polygraph community, engaged in experiments that attempted to prove that plants are sentient. I learned of these experiments while researching The Walking Ferns. Curious of the polygraph's uncanny ability to register sentience, I purchased a polygraph on Ebay and this launched two new bodies of work - The Directed Lie and Cause an Affect. Cause an Affect, shot in a studio situated in a lush jungle in the north Florida, successfully recreates Backster's experiment. 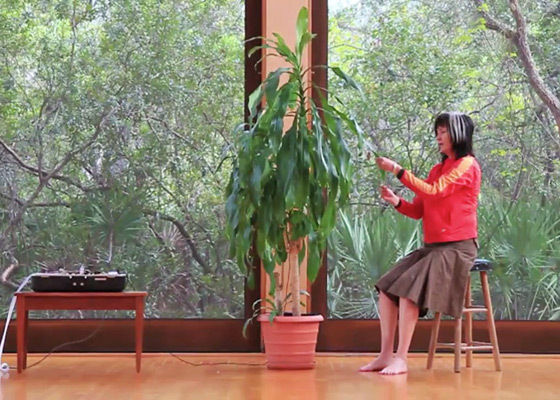 While the polygraph is attached to a Dracaena Massangeana (the same kind of plant that Backster used) I begin a playful performance focused on communicating with the plant through extra sensory perception. I think a range of thoughts, pleasant and harmful to the plant, and it would appear that the plant is agitated by my thoughts and actions, which are both soothing and aggressive. The plants reactions are simultaneously recorded and play as a dual screen projection along with my performance.